Beka and I love to play together. We play dolls, store, raft, school, restaurant, store and servant. She always lets me be the boss and she’s the servant, isn’t she sweet? so we like to play during school. It greatly improves math skills. So does scratching your head, we learned. In 2nd grade, Beka is learning money skills. The worksheet introduced the concept of counting back change. “dings” when you open it, is a must for math class. The worksheet was kinda’ confusing. It was kinda’ boring, too. I know my student is bored. While Beka priced her toys, I scribbled quick cards for each item. The box on the left is the price, the bill used to pay is in the middle. She had to use $5, $10 and $20 bills. First, she had to figure out change, using the lease amount of each coins. buying gifts for nieces, spoiled children, brats, and kids having birthdays. She recommended an item, took my money, and counted back my change. After I bought out the store, she had nailed the concept. We went back to the boring worksheet, and finished it in a few minutes. I’m thinkin’ boring doesn’t always mean just boring. Confusion can bring on boredom. math isn’t boring, it’s exciting. Then, we played, because that’s what we like to do. 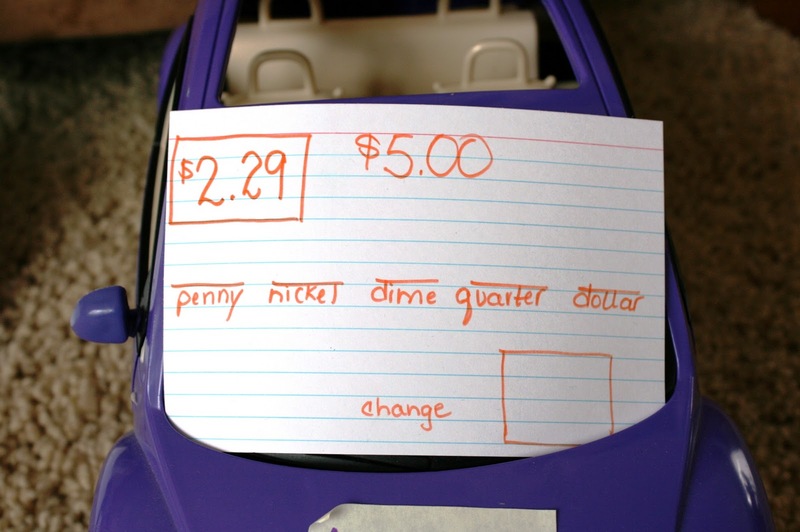 This entry was posted in 2nd grade math, counting change, elementary mathematics, math manipulatives, money skills, teaching second grade on April 19, 2011 by Mindy. Great Idea….I will have to remember it for next year. 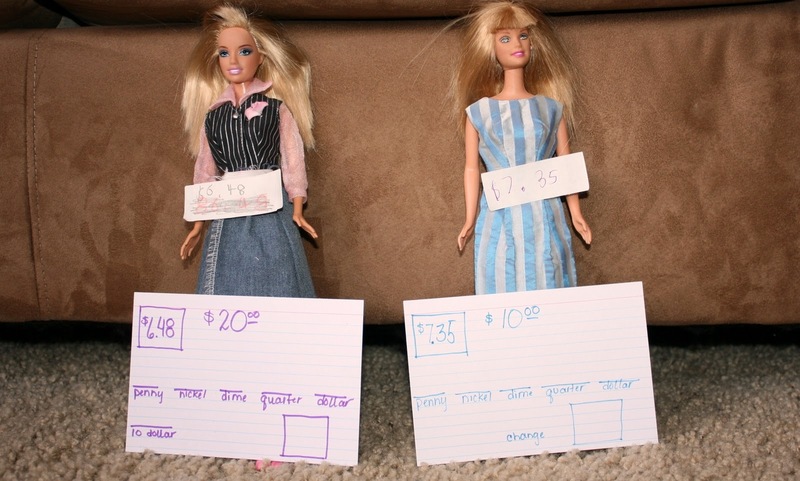 But I am sure we will be selling dino's and lego's rather than barbies! Yes! This is very much like what I have been doing with my daughter, Selah, who is five(though we aren't using very complex numbers at this point). : )She loves it! 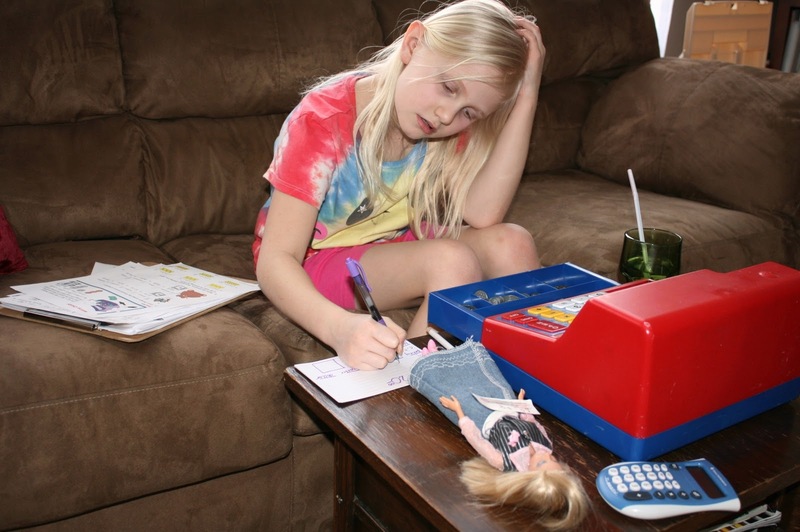 Because of games like this, math truly is her favorite subject! Thanks for sharing! I think this is why SCM's Pet Store Maths appeals to me for Jemimah. I will have to look into it more. The idea of confusion bringing on boredom is just so true, I think. When head scratching don't work, things are really, really bad! !